A paraben-free, sheer fluid that supports skin health and conceals visible issues. Blemish balm perfect beauty fluid for combination and impure skin combines the lightness of a toning fluid with the caring properties of a cream. The liquid, tinted "two in one"-product supplies impure and combination skin with important caring substances and provide a flawless skin coverage. It helps to regulate the skin processes and minimizes shiny skin, redness and unevenness. The fluid merges with the skin for an even, well-groomed complexion - all day long. Available in three shades. Aqua (Water), Cyclopentasiloxane, Titanium Dioxide, C12-15 Alkyl Benzoate, Propylheptyl Caprylate, Glycerin, Talc, Propylene Glycol, Cetyl PEG-/PPG-10/1 Dimethicone, Panthenol, Polyglyceryl-3 Diisostearate, Cera Alba (Beeswax), Simmondsia Chinensis (Jojoba) Seed Oil, Zinc Oxide, Dimethicone, Glycyrrhiza Glabra (Licorice) Root Extract, Plantago Lanceolata Leaf Extract, Berberis Aquifolium Extract, Lauroyl Lysine, Sodium Salicylate, Allantoin, Bisabolol, Rosmarinic Acid, Cyclohexasiloxane, Dimethiconol, Alcohol Denat., Tocopherol, Ascorbyl Palmitate, Glyceryl Oleate, Lecithin, Citric Acid, Sodium Chloride, Sodium Hydroxide, Sorbitol, Phenoxyethanol, Benzoic Acid, Dehydroacetic Acid, Ethylhexylglycerin, Polyaminopropyl Biguanide, Parfum (Fragrance), Hexyl Cinnamal, Alpha-Isomethyl Ionone, Geraniol, Citronellol, Benzyl Alcohol, CI 77492 (Iron Oxide), CI 77499 (Iron Oxide), CI 77491 (Iron Oxide). Schrammek Regulating Care Blemish Balm Perfect Beauty Fluid - Ivory contains: Aqua (Water), Cyclopentasiloxane, Titanium Dioxide, C12-15 Alkyl Benzoate, Propylheptyl Caprylate, Glycerin, Talc, Propylene Glycol, Cetyl Peg/Ppg-10/1 Dimethicone, Polyglyceryl-3 Diisostearate, Panthenol, Cera Alba, Simmondsia Chinensis (Jojoba) Oil, Dimethicone, Zinc Oxide, Sodium Chloride, Phenoxyethanol, Cyclohexasiloxane, Alcohol Denat., Lauroyl Lysine, Allantoin, Dimethiconol, Bisabolol, Glycyrrhiza Glabra (Licorice) Root Extract, Sodium Salicylate, Tocopherol, Lecithin, Ascorbyl Palmitate, Glyceryl Stearate, Glyceryl Oleate, Sorbitol, Rosmarinic Acid, Plantago Lanceolata Leaf Extract, Berberis Aquifolium Extract, Polyaminopropyl Biguanide, Parfum (Fragrance), Benzoic Acid, Ethylhexylglycerin, Dehydroacetic Acid, CI 77492 (Iron Oxide), CI 77499 (Iron Oxide), CI 77491 (Iron Oxide), Hexyl Cinnamal, Alpha-Isomethyl Ionone, Citric Acid, Geraniol, Citronellol, Sodium Hydroxide. • Apply on skin after cleansing. 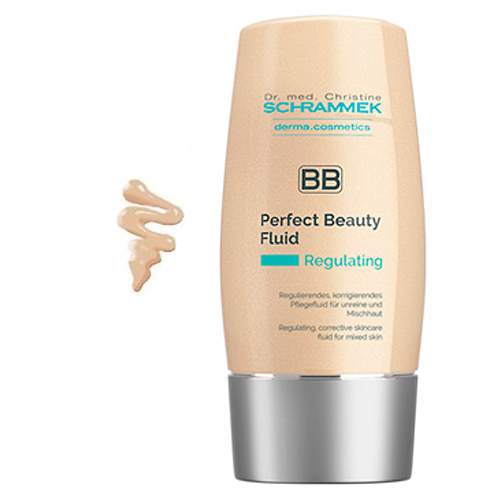 BLEMISH BALM PERFECT BEAUTY FLUID combines best skin care with decorative concealing for a beautiful and even complexion. • Tip: Convenient tube format for easy application, even when on the road.